As we have found with our previous tasting of 1999 Pinots and with Zinfandels, the 1999 vintage was a bit of a challenge to winemakers. The rather cool growing season meant that the fruit was not even close to maturity come the beginning of September. There is always the risk of a rain storm (or two) during this month, which can cause trouble. Either some fruit is prone to rot or the grapes swell, further diluting their character and sugar content. Happily in 1999, we had some typical spurts of "Indian Summer" and those with prudent crop levels and a certain amount of patience were able to harvest fruit in good condition. Many Pinot Noir vineyards in California's North Coast (and Oregon) were not picked until the end of September or early October. The wines we have tasted, so far, have generally had good levels of acidity. This means the wines may have good cellaring potential. It also means some of the major eno-scribes will not pay much attention to this vintage, preferring monster wines with high tannins, alcohol, oak and low acidity. Notes compiled by Bob Gorman, with Gerald adding his two-cents' worth. One taster found no defects but its extractive, overly tannic texture made it stand out in a field of fruity wines. Another found it bitter, sour and tannic; no body and no fruit! Bob said that the oak and ripe Pinot fruit conspire to produce a flat, earthy impression with a strong "cardboard" thing (probably the effect of inept lees contact) marking it down. The fruit gets brighter as it opens up. On the palate its a tasty, ripe enough brew but sharply acidic at the edges and thin in mid-palate with an angular, bitter finish. Gerald found "hints of cherry and rhubarb on the nose with a touch of nutmeg. It's a bit tannic and coarse, so the fruit doesn't shine on the palate. Half a star, to be kind." One taster found oxidized notes and another deemed the wine defective with serious stability problems. A kinder soul found it stinky at first but showing some fruit as it opened. Another found it sweet (i.e. residual sugar) but it tested dry when analyzed by Gerald. Bob observed corky, volatile notes, then a rather cloying candy-like Pinot fruit with odd herbaceous notes. As it opened up the fruit reminded of Ocean Spray Cran-Raspberry drink. The wine tasted soft, even flat with a brown sugar & butternut squash tone. Very strange! Gerald noticed the slight bit of CO2 in the glass, though the wine was clear. A cloudy wine, with evidence of a spritzy character, would be indicative of a stability (or instability) problem. The fragrance starts with a touch of sweet oak, but as you get to know this wine, it veers off towards something reminiscent of band-aids, plastic or rubber. The flavors are a bit candy-like, so if you enjoy Cherry Lifesavers, this is your wine. Tasters had difficulty with this wine. A for amateur, said one (the wine was "Exhibit A on our blind tasting sheet). Flat, horse manure and bitter, green stems, said another. A third taster characterized it as dirty, woodsy. Bob, however, much liked the wine. It has a nice "soft" aroma, ripe Pinot Noir fruit, spice, minerals, cola nut, becoming more plummy, "Pommard-like" as it opens. With classic Pinot fruit, it has a subtle oak presence that gives it a nice richness. The wine is supple, nicely balanced with a spicy, clean aftertaste. Gerald found "mild, forest-floor notes with a slightly Burgundian note of beet root...bright and fresh on the palate, this shows some cherry notes and a nutmeg spice...curiously, I found nutmeg in the other Shea vineyard wine from St. Innocent. 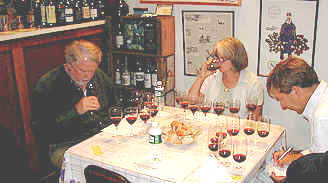 The wine found two fans who thought that it was the most Pinot-like of the set and the most intense in the mouth. Others found cherry flavors and a hot, astringent wine. Critics found Hydrogen Sulfide, matchstick odors and odors of roasted grain and silage. Bob disliked the cherry cough syrup notes but found a nicely ripe bit of Pinot fruit emerging as it opened up. However, an unattractive earthy thing tries to get in the way. Soft and ripe in the mouth, that cough syrup tone appears here too. The wine is shallow with a flat finish. Gerald found sweet fruit and mild cherry notes with light oak. The flavors were good, berries and cherries with some vanillin notes. A bit of tannin gives an edge to the wine. One star." One taster found nice Pinot aroma and a big mouthful of juicy, chewy, clean fruit with a brambly edge. Another found up front fruit but a bit sour. But another taster downgraded it: theres not much there; a simple, empty wine. Bob found some bright, dusty Pinot fruit (perhaps some whole cluster fermentation?) and an earthy undertone. He mistakenly pegged this as a standard Oregon Pinot, light, spicy and hints of candy. It tasted like standard Oregon Pinot too, light, tasty, one-dimensional but a nice little drink of Pinot. Gerald felt this was more like an aged Beaujolais, as it was not terribly profound and a bit simple. "A decent $10 Pinot." Whoops! Too bad it costs a bit more than that! One taster waxed enthusiastic: this is a concentrated, terrific Pinot, smoky and rich, showing excellent varietal character. By contrast, another found little varietal character, rather Zin-like with its raspberry fruit and abundance of Brettanomyces. Someone felt this was "terrific, with toasty, smoky scents...minty and delicious!" Another taster was distressed by a fallen apple scent and hints of oxidation. Bob also found leathery notes from the Brettanomyces but thought it attractive rather than stinky. There were also green, stemmy, herbaceous notes and some cherry Pinot fruit in there somewhere too. But on the palate the leather dominates the Pinot fruit, giving it a curious Chinese "Plum Sauce" cloying edge. Gerald found those leathery notes in the wine, with hints of wet leaves and forest floor tones. On the palate it's a bit hot and not terribly fruity. Standard. Tasters showed moderate enthusiasm for this wine. Sweet tasting, dusty, a fair bit of oak, tobacco, high acid, were a few of the comments. Bob was far more enthusiastic. He found a "luscious, generous tone and yet its bright with beautifully ripe Pinot fruit. Generous French oak adds a layer of depth. The wine is luscious on the palate too. It has an herbal edge but ripe Pinot fruit dominates. The wine should gain considerable complexity as it ages over the next few years. Gerald found lots of sweet cherry notes with a vanillin undertone from the barrels. It is even more impressive on the palate, showing more intensity than promised on the nose. Nice cedary, oaky notes with vanilla and cherries. Very fine. Two stars+. 1st Place: PAUL HOBBS Carneros, Napa Valley "Hyde Vineyard"
Most of the taster agreed that this is a BIG wine, herbal, extracted and perhaps a bit over-ripe. One taster complained about the bitter tannins but another countered that theres plenty of fruit to compensate for the tannins. Bob found ripe, spicy, creamy notes with black Bing cherry fruit darkening to cherry jam. Theres no denying how tasty it is for being so ripe, hot & jammy! Its length is remarkable and theres considerable depth. Its not my style but I like it! Gerald liked the sweet vanillin notes in this wine which had fragrances reminiscent of cherry pie, root beer and tobacco. The texture is very fine, with some tannins to balance the 'sweet' fruit notes. Two stars.